It’s certainly no secret that we PRs are, on the whole, terrible at proving our worth. Measurement is banged on about again and again at (expensive) conferences around the world and still – we’re no closer, collectively, to giving clients a financially valid reason to stick with us. In this post, I’ll be offering a way to do just that – something I think we’ve simply been overlooking – again, on the whole, that is. Let’s say you get your client, an online retailer, coverage on the Telegraph. There’s a link through to your client. You can find out how many social shares that piece received (Buzzsumo, Topsy and TweetReach being my three favourite free resources to start with). Is that what you report? A link to the coverage, the number of unique visitors per month the site gets, perhaps, the social ‘buzz’ it generated and, using something like TweetReach, an estimate of the reach/impressions of said shares? I’ll let you into something and I’ll try to keep it as simple as I can. There is a way to then tell that client how much money, if any, that link on the Telegraph made for them. Here’s where, when I’ve tried to discuss digital measurement of the value of our activity in the past, people often switch off. One PR person that handles the accounts of some pretty big brands – the type of person who’d die happy if Joey Essex retweeted her – actually said, and it’s stuck with me: ‘I’ll never be geeky enough to care’. Because wanting to provide a return on a client’s investment in us is geeky, OBVIOUSLY. Ask visitors to sign up to a newsletter? Give visitors the ability to download information? Give visitors the chance to buy direct from the site? If you’ve answered yes to any of the above (most will), please do read on. how long visitors stay onsite for, and much more. 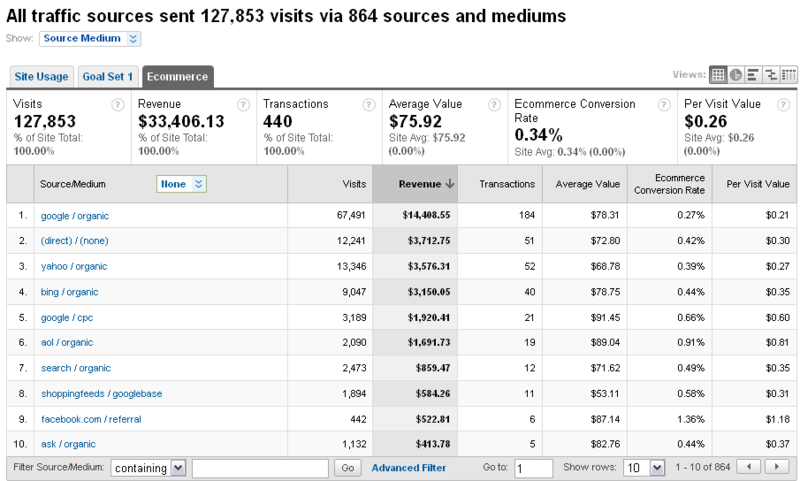 What Google Analytics also allows you to do is set up Goals. 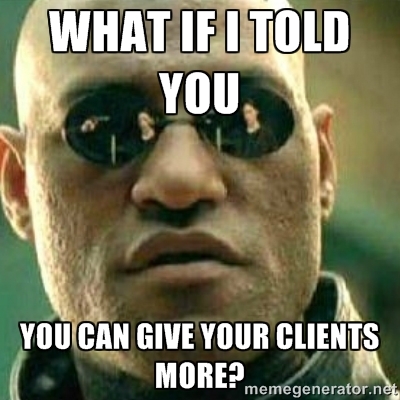 Put simply, Goals will allow you and/or your client to measure your marketing activity. It goes beyond the traffic stuff mentioned above and gets into what those visitors you’ve sent them actually do when onsite. Imagine being able to show your clients how many newsletter subscribers, downloads or sales came as a direct result of your work. Imagine being able to say – our activity sent you X,000 unique visitors. Of these, X bought your product for £X. That’s £X we can prove you made as a direct result of our work. Better than a meaningless ratio of [how much the client pays per month] : [the advertising value equivalent of that month’s coverage], no? You see, it all begins at the end. The ‘thank you’ page a completed online form or purchase sends you to acts as the ‘goal’, from which we can work back. You can check drop-off rates using ‘funnels’. What that means is, using the pages leading up to the ‘goal’ page you can see the visitor path, including the stages visitors drop off. Going back from there, you start to seeing where that traffic came from, how much money they spend, which traffic converted and even what links they clicked on. 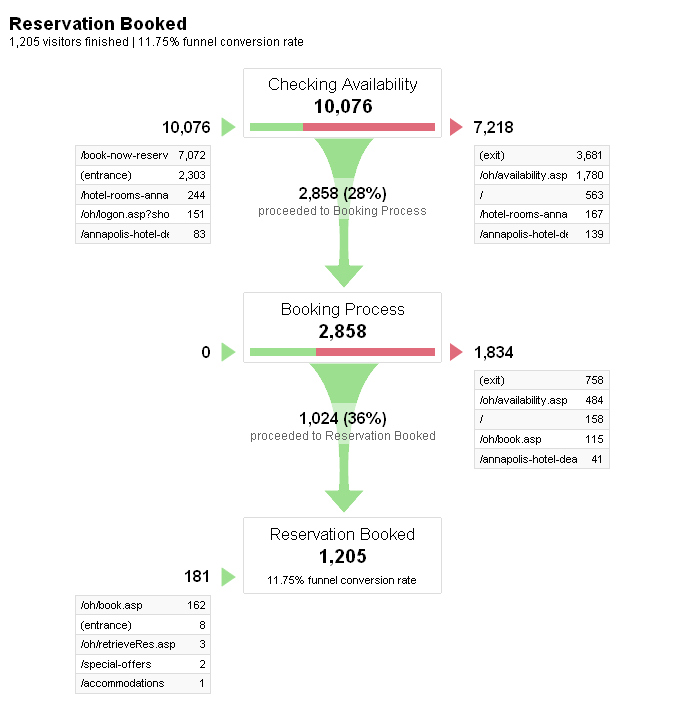 (this image shows the goal funnel of a hotel reservation process, found on WebMechanix’s ‘3 Google Analytics Features You’re Not Using (Yet)). You might be surprised by the social network, media outlet, blog or ads that send the most profitable traffic and, as such, you can alter your efforts accordingly. This can save you time and your client’s money – but, most importantly, begins to provide value beyond the time-honoured ‘we got you coverage and/or people tweeting about you, what more do you want! ?’ PR approach. As I say, this is all entirely possible right now – and has been for a few years. Although I’ve used Analytics with clients for a few years now, I don’t profess to be a Goals expert by any stretch, yet. Nor am I even the first person to point out how Analytics can and should be used in PR. Justin Cutroni, an ‘Analytics Evangelist’ at Google wrote this insightful blog called ‘Google Analytics for PR last year, and Escherman’s Andrew Smith wrote about it back in 2011, in a blog entitled ‘Top 5 reasons PR firms should ask clients/prospects for access to Google Analytics data’. These are both useful reads. Since delving into Goals, my experience has been limited to a couple of freelance PR clients, but results are promising so far and, yes, have proved the financial results of my PR activity in a way I couldn’t have prior to using them. The key thing is to ensure you understand exactly what is measurable before any activity takes place, be it sales, downloads, subscriptions or something else, and then work backwards. Even the type of PR stunt-based activity I love and feature regularly on this very site can be measured, provided there’s a call-to-action strong enough to get people on your client’s site. I understand that PR is often about more than making the client money and building them a mailing list (brand awareness is a tougher benefit to measure), but I’d suggest that PR is about creating an action/reaction that attains the clients objectives – and I can’t remember one single client for whom the bottom line wasn’t the bottom line. Now, I’m not saying this is the definitive answer to our measurement woes. What I am doing is sliding this across the table, in the hope that you are geeky enough to care. Follow me @RichLeighPR if you fancy having a virtual chinwag about all this. But if I respond to a tweet whilst on holiday and my wife spots me, I’m blaming you. If the old guard aren’t geeky enough to care, then they will do well to check behind them as the new generation comes hard on their heels. We’re here, and some of us already use this on our personal blog. Adapt or perish. Cheers for reading and taking the time to comment, Jonathan. Worth mentioning though that said non-geek is 20-something, clearly with a very narrow view of what PR is and can do. Thanks for the TweetReach mention! Much appreciated. I think that PR has traditionally offered a career for those who are good at writing, wanna-be journalists, ex-journos and people who like drinking with journos. Post digital-revolution, its not enough and the skillset/mindset has to evolve. Find your inner geek!